It’s our baby boy’s half birthday today! I cannot believe that we’re almost at the big one-year milestone. How is it already been 6 months?! Of course we’ll be celebrating his first birthday (which is coming way too quickly), but we are also celebrating this milestone—6 months old! I’m sure you’ve noticed some major changes over the months with your little one and there are some fun reasons why we all should be celebrating our babies’ half birthdays. So here are six things to get excited about and celebrate with your sweet six month old. The World Health Organization, the American Academy of Pediatrics, and the CDC all recommend that babies start solids at the age of 6 months. Up to this point breast milk and/or formula have been the food sources for your growing baby. But now your little one has graduated to big boy/big girl food! Let’s celebrate! 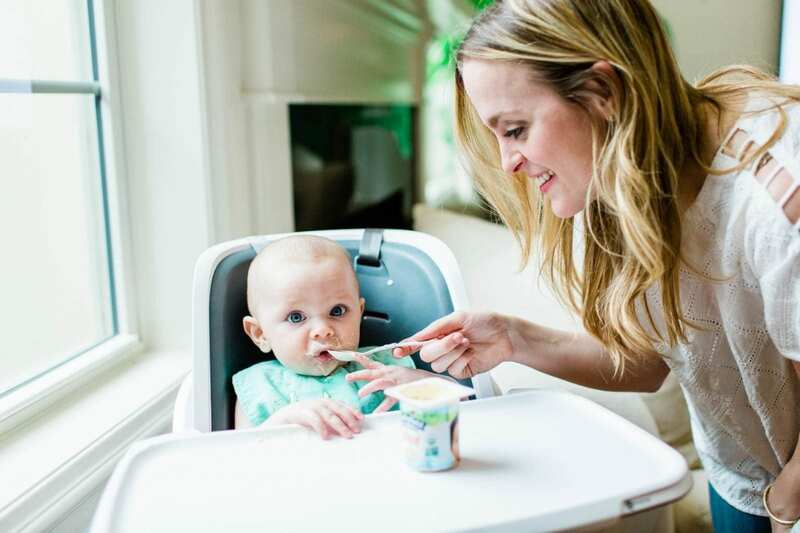 If you’re unsure what foods to first introduce to your baby, we have you covered here. 🙂 We recommend to introduce solids one at a time to your baby and to wait a few days before trying a new food. This will help her adjust to solids and will allow you to see if she is allergic to anything. I was so excited for my son to hit this milestone so that I could finally introduce him to some food and see how he would react. We gave him some banana YoBaby Stonyfield yogurt and it was a big hit. It was fascinating watching him put the yogurt in his mouth, seeing him feel the texture on his tongue and tasting the flavor. Every time I pulled the spoon away he became anxious and upset so I feel like we’re going to have a good eater on our hands. If you’re concerned about giving your baby cow’s milk before the age of 1, it’s actually okay to give them yogurt as early as 6 months because the cultures make it digestible. This is why pediatricians recommend it and we love that Stonyfield’s YoBaby organic yogurts is #1 pediatrician recommended for babies 6 months to 2 years! Now that your baby is eating solid foods (and continuing to have breast milk and/or formula) she should be sleeping a little longer at night. Most babies are sleeping six to eight hour stretches by six months old. Hallelujah! Because their little bellies are getting fuller and they have learned some self-soothing techniques over time. They are now able to sleep a little better and a little longer. That causes us all to celebrate!! Note: If your little one is having trouble falling or staying asleep, you can research and experiment with several different sleep methods to see which one would work best for you and your baby. My son is quite the talker now and I bet you have noticed your baby babbling quite a bit now too. At 6-months-old babies should be smiling, laughing, and babbling away (“ma-ma,” “da-da,” “ba-ba”). It’s fun to see them express themselves and see their little personalities shine through. To encourage your baby to talk and help her learn the language, I recommend reading to her, talking her through your day about things you’re both doing and seeing. She will learn and build her speaking skills and vocabulary by listening to you so talk away! I love this milestone! Babies are so happy when they are able to sit up, look around, watch you and play. A lot of babies are able to sit up unsupported at 6-months-old, but if your baby isn’t quite there that’s okay. It should happen soon! Continue to help her sit up and over time her core will get stronger and she’ll be able to sit on her own. I particularly like this milestone because my baby can now be pretty content by himself since he is able to see and do so much more. He can sit perfectly in his highchair for meals, in the cart at the grocery store, and in a high chair at a restaurant. For some reason my son hated laying on his back or his stomach for more than five to ten minutes at a time. He wanted to see what was going on and be in the action. Thank goodness for this milestone! At 6 months our babies are more playful and interactive. It is the best to watch my husband and son play together. That’s right, play together! Liam thinks it’s hilarious to watch my husband chase the dogs, “fake” hurt himself and of course tickle and kiss him. He even likes to watch and mimic him when he eats. They are having too much fun together now which makes it nice that daddy can bond even more with our baby. I’m sure you’ve noticed that your 6-month-old is more responsive to you and your emotions and is more curious. They seem happier and can also respond to their name. It’s also great that our babies now remember people that they are seeing a bit more regularly rather than just mom and dad. So if they see grandma and grandpa, friends or other family regularly they won’t respond as “stranger danger.” That’s great for us parents so we can have a little break and still have a happy baby. This is a big deal. You have kept this little baby alive for six. whole. months. You have survived and made it halfway to a year! Way to go for being a rockstar parent. 😉 And I’m sure you can agree that the days definitely feel long, but doesn’t it feel like just yesterday when she was just a little newborn sleeping on your chest after a meal? Now look at you both! Our babies are growing up. Before you know it we’ll be celebrating our baby’s one year birthday. So soak it all in, mama, and celebrate today!